Why's everyone so scared of the F&B minimum? The reason people gather for face-to-face meetings each year is the riveting content presented at those meetings. But what people really remember are the banquet events (i.e., catered breakfast, lunch, and dinner). They provide the opportunity for attendees to take a break, come together, and create bonds. It’s here where much of the day’s sessions are put into perspective, discussed and debated, and where the real value of the event often begins to take shape for each attendee. It’s also where a fair portion of your meeting budget is spent and where hotels make a nice chunk of profit. In order to protect this revenue stream, hotels almost always include a minimum Food & Beverage spend in their contracts. During my hotel sales days, I always found it funny when a customer would attempt to negotiate down our hotel food and beverage minimums, when it was clear by the size of the group that they were going to end up spending more than what we were asking. Now I get the premise: Less committed spend means less overall commitment to the hotel. But when groups do blow past their F&B minimums, they get no additional benefit for the spend. What happens if we turn the idea of the F&B minimum on its head? Instead of thinking of the minimum as a liability, try seeing it as a benefit that can help drive better value from your hotel partner. Here are a few ideas to help you get more value out of your food and beverage spend. Tip 1: Add a second F&B minimum to unlock extra value. Sounds crazy, right? Not really. If you happen to be spending more than what the hotel requires, you’re leaving money on the table. 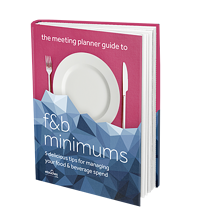 Think of it this way: The first F&B minimum is for the hotel … the second minimum amount is for your company. Here’s a real-world example. Say you’re having a sales manager retreat, with 50 people for three nights. That’s three breakfasts, three lunches, three dinners, and at least one cocktail reception. You do your homework and come up with your budget for the event. Then ask for some things that will create real value for your group. Need more suite upgrades? How about IT help? Whatever you might be missing from your bag of goodies can be leveraged with an F&B maximum clause. Tip 3: Ask the hotel up-front what their F&B minimum is for your dates – not your program. Most hotels have a minimum amount of F&B spend that they need to earn per room-night. You can bet that this number varies widely based on the time of year. If you’re planning an event that has a lot of food & beverage spend, ask the hotels to quote you their per-day F&B minimum. It’s a great number to have before you start negotiating. Knowing this number also lets you gauge the likelihood that the hotel is the right fit for you and your budget. It will also help you understand if you have leverage with the hotel already built into your budget. If you have the history of what you have spent in catering or in outlets, share it with the hotels. 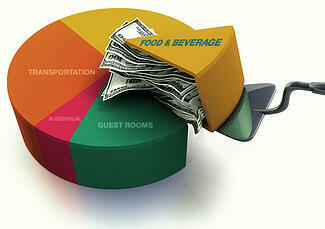 Next time you operate a meeting, ask your host hotel if there is a way for them to track your F&B spend for you. It’s always helpful to have this handy! If you were planning on taking a dinner off-site, can you keep it on-site? Often times, hotels charge a room rental fee to make up the shortage of F&B spend. Why not take that fee and apply to your food budget, so you'll be sure to get something in return?